Since Prof. Shin Yong-In made public civil disobedience movement on Nov. 11 ‘for the peaceful settlement of the conflict of the Jeju naval base project and for the realization of just law,’ the movement has been extended by the below figures with their open statements. People have already been practicing it in contents in the struggle but with the name endowed, it is expected that the movement would more grow in coming days. Otherwise, the below is a collection of open statements (excerpted translation) by four figures who joined the civil disobedience movement from Nov. 13 to 15. 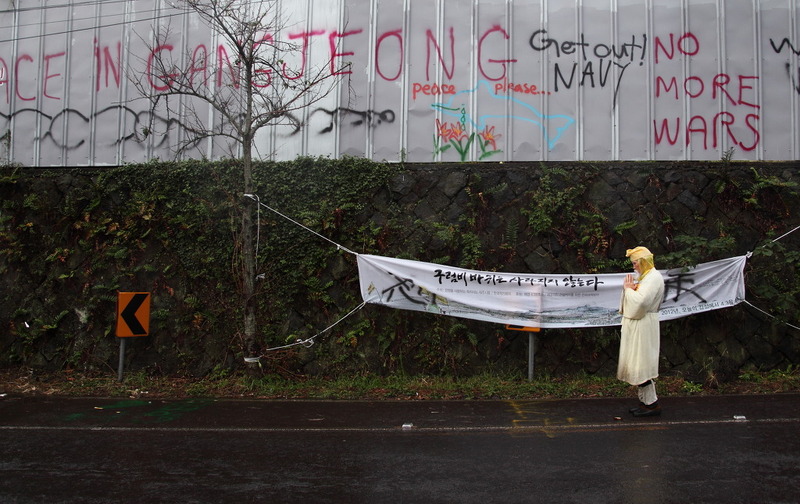 The Jeju naval base project should be revoked! 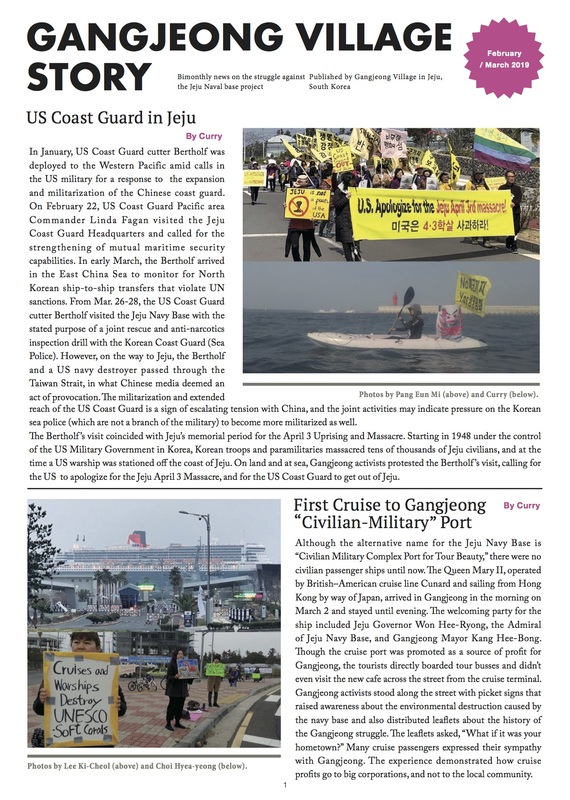 The Jeju naval base construction(destruction) should be stopped since the legality enforced with lies, betrayal, illegality, law-evasiveness and violence is a clear proof of illegality. The Government, navy and police should immediately stop violence. Free all the conscientious prisoners! The related personnel to the exposed problems on the Jeju naval base construction during the National Assembly inspection on the government offices should be responsible for charges. 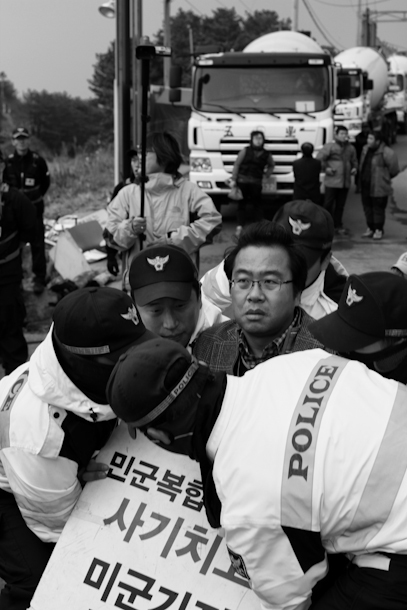 Otherwise Carol Reckinger, a photographer, is making wonderful records on the civil disobedience movement in Gangjeong. Please visit her blog. Photo by Carol Rekinger, in her blog on civil disobedience movement/ Rev. Choi Hun Kook is carried away by the Police. The article 13 of South Korean Constitution stipulates the role of state for the social weak, considering the basic rights to live most important. The article 1 of the Bonn Constitution (Basic Law For The Federal Republic of Germany) talks about the inviolable on the dignity of human beings as well as stipulates to make best effort to protect the human rights of the economical and social weak. Those mean that law should be a standard for every citizen to live human life. In the country where money and power are concentrated, to have a virtue of concession to the weak is established as the basis of law. It is because of it that the function of law which is a regulation to set up the social community order becomes the function of good will for the protection of human rights and the weak.[..] 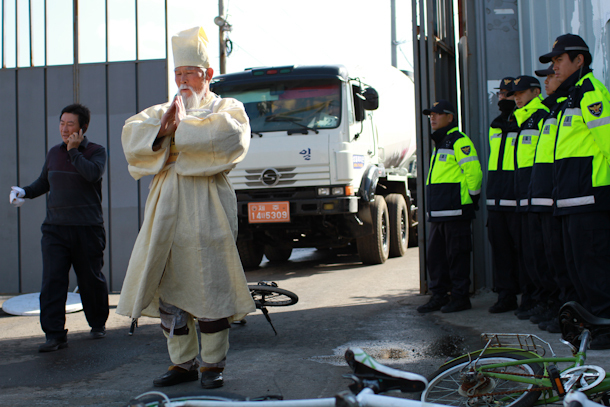 Facing against the state power executed with physical power for the enforcement of the Jeju naval base construction, being reasoned that vicious law -used as the tool of violence- is positive law, I am joining this movement as a form of civil disobedience from the consciousness of religious person, which is a just act based on the justice of God. Currently, the Gangjeong village is being trampled down of such perfect “life,” by violence and greed. Also after April 3rd [massacre and people’s uprising from 1947 to 1954], “human rights” is being trampled down by state power in the Jeju Island. Even though it is clear that it would be used as the US base, the [state power] unilaterally enforces sacrifices of [the Island people] for fake security and puts against justly raised different opinions with the bridles of labels such as ‘Pro-North Korea,’ and even ‘Reds’. The state is inciting greed of the Island people with the bite of so-called economic development. Any economic development will only profit the pockets of the rich again. The Jeju Island would be destined to take only the debt of destruction [..] I am to stand sided with the law of consciousness in the site of such treason, not to regret my life as one of the Jeju Island citizen and artist.[..] 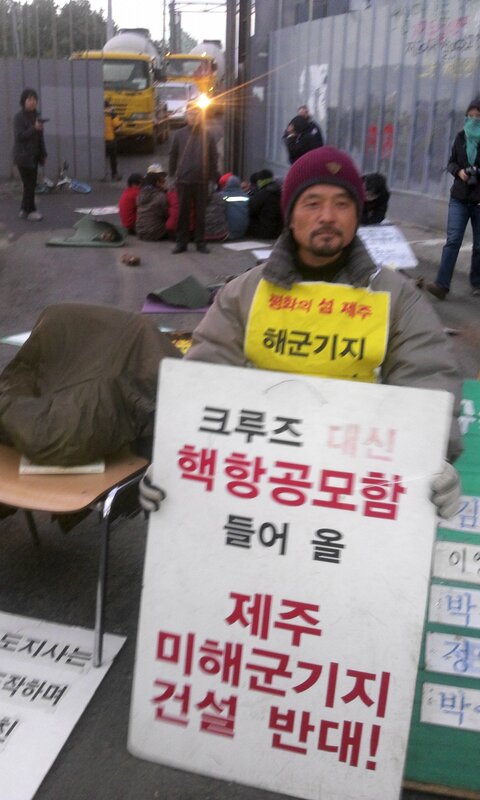 I urgently appeal to many citizens, Jeju Island people, and artists to join this civil disobedience movement. Starting on Nov. 14, I will stand in front of construction gate with peacekeepers, with the aspiration of every conflict to be peacefully settled, every 2pm to midnight, Wednesday. I will join the civil disobedience movement from the start of 100 bows for life and peace in the morning to the last time of construction vehicles’ passage on the day of Nov. 16, Friday. Civil disobedience movement is another name of direct action named ‘Manshijitan (that means ‘10,000 citizens scold’) that started last spring. Now facing, beside the Manshijitan incident, prosecution and judgment of the 1st trial, under the charges of obstruction of business by the incident called Churchmen Entering the Gureombi Rock on April 3rd, 2012 and by stopping construction vehicles, I declare participation in the civil disobedience movement that is to save democratic procedures in non-violent way and to recover my consciousness as a devotee. It is because I believe in that the civil disobedience movement will stop the enforcement of the Jeju naval base construction and will be the kindling to save the Gangjeong village. 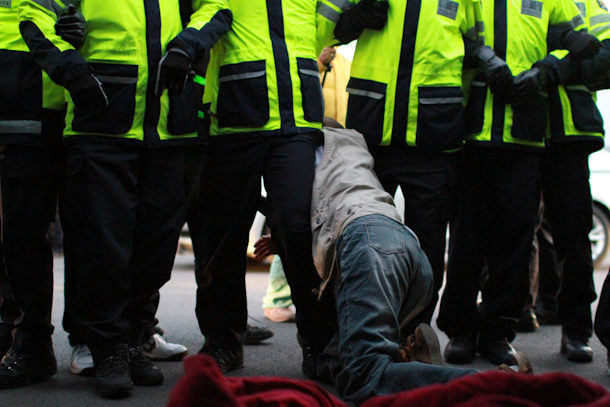 [..] We are not the people to be tamed by violent state power, fine or prison punishment. There is no fear for the people who make effort to save peace. There is no happier thing for the devotees to suffer from their practice of Jesus’ gospels with their whole bodies. Photo by Cho Sung-Bong / Mr. Oh Cheul Geun in the rain. 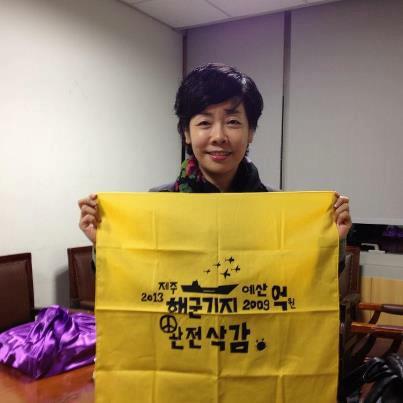 I am Oh Cheul Geun(66). I have practiced three steps one bow in Gangjeong from Nov. 14, 2011 to April 10, 2012. I am doing it again til I arrive the main construction gate of the Gangjeong village everyday since Oct. 24. I always wear a [traditional] funeral cloth when I do three steps one bow. There are four reasons. First, it means, death of sovereignty, second, death of human rights, third, death of democracy and last, death of the Gureombi Rock. I fully feel them as my responsibility and pray for everything to be returned back to its original place, by practicing three steps one bow everyday. Then I became to join the civil disobedience movement. As I feel that prayer cannot solely solve the matters and as I see peacekeepers and villagers who are bruised and injured and feel difficulty everyday, I became to keep pace with direct resistance, too, by joining civil disobedience movement.[..] Even though the legal system of the Republic of Korea is based on the spirit of Constitution espoused of Democracy principle, positive law has become creeping, even distorting the Constitution. To change the reality when enforcement decree and regulations made by the administrative reign over the Constitution, I became to stand countering against the police violence blow because I desperately hope many more citizens to join this civil disobedience movement. Free all peace activists and villagers! Stop the fake naval base! Stop the illegal construction! Cut all 2013 naval base budgets! [고길천] 제주해군기지 건설강행을 반대하며, 평화적인 해결을 바라는 마음으로 시민불복종운동에 동참합니다. [임보라목사님] 제주해군기지 건설 백지화와 신앙 양심의 회복을 위해 시민불복종 운동에 동참합니다.